THE Asia Art Link 2010 Exhibition “Linking the Dreams” opens on October 28, 2010 at the Cultural Center of the Philippines’ Pasilyo Vicente Manansala, Pasilyo Guillermo Tolentino and Pasilyo Victorio Edades (Second, Third and Fourth Floor Hallways). 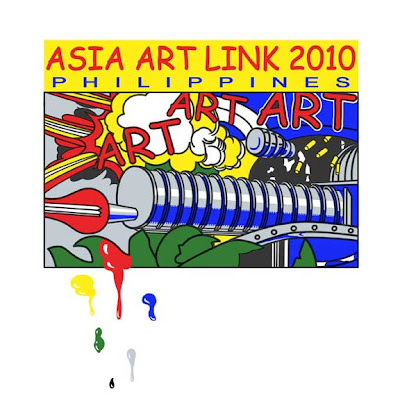 Asia Art Link was initiated by Asian artists centering on the belief that art can help transcend borders, and can build bridges instead of walls, despite cultural, historical and political differences of nations. A brainchild of prominent artists/organizers Ng Bee of Malaysia and Trinh Tuan of Vietnam, with able support from Filipino artist Jeho Bitancor, Asia Art Link first took shape during the three artists’ show at the Viet Art Center in Hanoi in 2007. Geared towards establishing a platform where artists from the region can converge and exchange recent developments in visual art practice, Asia Art Link was launched at Hanoi Fine Art Museum in 2008. It was a showcase of 32 artworks, mostly paintings and sculpture from 31 emerging and established artists from Japan, Taiwan, Malaysia, Philippines, Vietnam, Laos and Thailand, with a special participant from France. The exhibition, which represented cross-currents in contemporary art-making, proved to be a success and left a significant mark in the cultural life of Vietnam. In late 2009, curator Susan Lin and foremost Chinese ink painting artist Chen Yung-Mo from Taiwan hosted Top of the World: Asia Art Link Exhibition held at Taipei 101 Observatory, juxtaposing Art in Village: Bamboo Village International Art Workshop in Yilan County, Taiwan reinforcing it as an emerging avenue and venue for artists to explore the diversity of culture and visual languages that have continued to evolve. This year, the Asia Art Link 2010 Philippine Committee spearheaded by artists Jeho Bitancor, Salvador Ching, Dennis Gonzales, Norman Dreo, Roen Capule, Ruel Caasi, Salvador Convocar and Noel Pama takes pride in hosting the event. The exhibition will also feature established Filipino artists Ramon Orlina, Junyee, Pandy Aviado, Fil Delacruz, Raul Isidro and Leonardo Aguinaldo representing the diversity of Filipino artistic expression from different generations. About 50 artists have been invited from nine Pacific Rim nations including Singapore, Korea, and Denmark and the scope of the event includes a wider array of expressions from painting to sculpture, performance art and multi-media installation. Vietnam: Trinh Tuan, Nguyen Ngoc Phuong, Tran Nhat Thang, Bang Si Truc, Nguyen Minh Phuoc, Nguyen Van Cuong, Nguyen Tran Cuong. As Asia Art Link continues to evolve, it is important to perceive it not only as a gathering, but a dynamic venue for artists and communities to renew ties and establish grounds to define commonalities and understand differences. Asia Art Link is a moving dialogue in the changing culture of the world. The exhibit opens on October 28, 6:00 pm with a Gala Reception at the Main Theater Lobby of the CCP. CCP President Raul M. Sunico is expected to welcome guests, Malaysian artist Ng Bee will give the remarks for Asia Art Link, and Virgilio Aviado will give the response on behalf of Filipino artists. Performance numbers will highlight the evening. Admission is free. Gallery hours are from 10:00am-6:00pm daily except Mondays and holidays. For particulars, call CCP Visual Arts (632) 8323702, Tuesdays-Fridays 9:00am-6:00pm.